In this photo made on Saturday, Feb. 16, 2013, a worker walks on top of a container of chemicals used in the making of a brine water that is then pumped below the surface in a hydraulic fracturing process to release natural gas from shale deposits at a gas well site in Zelienople, Pa.
Water use for fracking by oil and gas operators in the Marcellus Shale region rose 20 percent between 2011 and 2016 as longer laterals were drilled to fracture more gas-bearing rock, even though the pace of well development slowed in response to low natural gas prices, a Duke University study said on Wednesday. The rise was the smallest of any of the six U.S. regions studied, including the Permian Basin area of Texas, where water use surged by 770 percent over the period. The study also said the volume of fracking waste water produced in the Marcellus – which includes Pennsylvania, West Virginia, eastern Ohio and southern New York, where fracking is banned — rose four-fold to 600,000 gallons in 2016, forcing energy companies to rely increasingly on holding the waste in underground injection wells. But the Marcellus waste water increase was also significantly smaller than other regions, where it rose as high as 1,440 percent during the period, the report said. Although fewer new wells were drilled during the period than in the early stages of the fracking boom, more water was needed because longer wells required the fracturing of more rock, said Andrew Kondash, the paper’s lead author. The median water use per Marcellus well rose to 7.4 million gallons in 2016 from 6.1 million gallons in 2011, Kondash said. The peer-reviewed study, published in the journal Science Advances, shows the fracking industry is having an increasing impact on water resources after more than a decade of operation, said Avner Vengosh, professor of geochemistry and water quality at Duke’s Nicholas School of the Environment. “We clearly see a steady annual increase in hydraulic fracturing’s water footprint, with 2014 and 2015 marking a turning point where water use and the generation of flowback and produced water began to increase at significantly higher rates,” he said in a statement. The study, titled “The Intensification of the Water Footprint of Hydraulic Fracturing,” was based on six years of data from industry, government, and nonprofit groups on water use and waste-water production at more than 12,000 wells in major shale gas and tight-oil producing regions. The data were used to model future water use and waste-water volumes, and concluded that if oil and gas prices recover to levels last seen in the early 2010s, water and waste water volumes could surge by as much as 50 times in unconventional gas-producing regions such as Pennsylvania by 2030. Even if gas prices stay at current low levels, the model predicts large increases in water and waste-water volumes by 2030, Kondash said. Natural gas futures have traded below $5 per million British thermal units on the New York Mercantile Exchange for most of the last eight years amid plentiful supply from the Marcellus and other major U.S. shale reserves. On Monday, the contract ended at $2.93, and has shown little movement this year. The Duke study is in line with one by Pennsylvania State University in 2015 showing that fracked wells in Pennsylvania used about three times as much water in 2014 than they did in 2009 as drilled laterals extended to an average of 7,000 feet from 2,200 feet. Those wells produced about three times as much gas and three times as much waste water, said Dave Yoxtheimer, an extension associate with the university’s Marcellus Center for Research and Outreach, and a co-author of the study. He said there has been a roughly ten-fold increase in gas production in the Appalachian Basin since 2010. The use of water per foot didn’t change much over the Penn State study period, but the big extension of laterals underground consumed a lot more water, he said. “Certainly as you see longer laterals and greater production you’ll use more water and generate more brine,” Yoxtheimer said. The longer laterals have been enabled by improvements in technology, said John Quigley, former secretary of Pennsylvania’s Department of Environmental Protection and now director of the Center for the Environment, Energy and Economy at Harrisburg University. Demand is also fueled by the fact that some 80 percent of water used in fracking remains underground, even though more of it is being recycled, he said, arguing that increased use of injection wells to hold frack waste water threatens ground water and increases the risk of seismic activity, as seen in some locations where minor earthquakes have been reported near injection sites. Quigley said pressure on water supplies for fracking is likely to intensify if climate change brings droughts, as predicted, possibly forcing energy companies to curtail fracking. That outlook may improve the prospects for adoption of waterless fracking technologies that use CO2, LPG or nitrogen instead, he said. The Duke report echoed the concern about the sustainability of fracking in arid regions such as the U.S. Southwest where groundwater supplies are stressed or limited. Duke’s Vengosh said the report, after more than a decade of the so-called fracking boom, provides a more accurate picture of the industry’s water use than earlier studies which used only the early years of the boom to conclude that fracking didn’t use any more water than other energy sources. “We now have more years of data to draw upon from multiple verifiable sources,” he said. 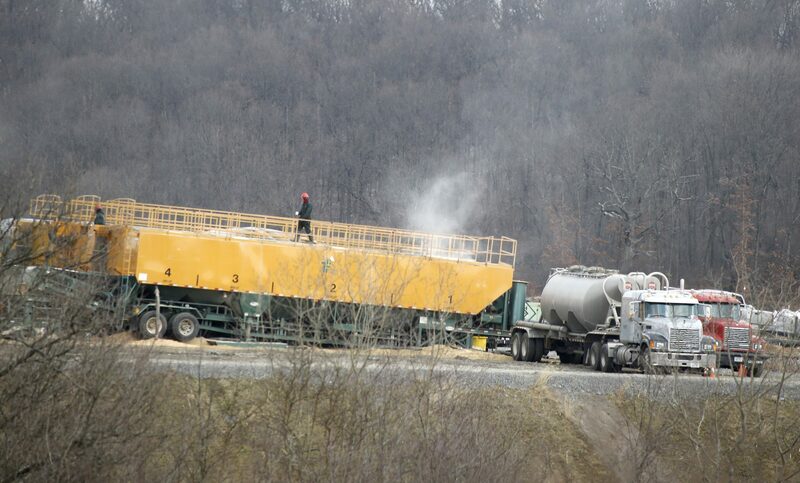 An industry representative said officials will review the Duke report in light of the industry’s current practice of managing fracking waste by reducing, recycling, treating and disposing of it in an environmentally sensitive manner. “Throughout each step the focus is on environmentally sound and responsible methods of disposing of generated waste materials,” said Stephanie Catarino Wissman, executive director of the Associated Petroleum Industries of Pennsylvania, a division of the American Petroleum Institute.